Combine the vinegar, garlic, salt, and pepper in a medium size bowl. Slowly whisk in the olive oil. 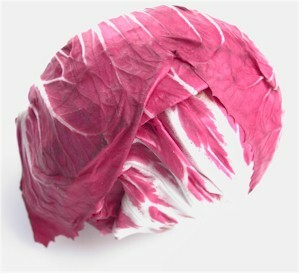 Mix the lettuce and radicchio in a salad bowl. Just before serving pour on the dressing and toss. Divide the salad among 4 salad plates. Place 3 apples slices on one side of each salad, and one quarter of the fennel on the other side. Sprinkle the pecans all over the salads. Serve immediately.